I would like to thank the individuals who agreed to be interviewed for this article: Hissan Bajwa, Michal Rosenn, Bonnie Broeren, Rob Chesnut, Eric Goldman, Jay Monahan, Ari Shahdadi, Curtis Anderson, Ed Ferguson, Michael Cheah, Hansen Tong, and Miranda Lerner. Katherine Schloss Ackerman (Penn ’17), Elyssa Eisenberg (Penn ’18), and Michelle Kao (Penn ’18) provided research assistance. Tom Baker, Shyam Balganesh, Danielle Citron, Zev Eigen, Meirav Furth-Matzkin, Eric Goldman, Ethan Leib, Sophia Lee, Greg Klass, Florencia Marotta-Wurgler, Melanie McMenamin, Lior Strahilevitz, Rick Swedloff, Michael Risch, Tess Wilkinson-Ryan, David Wishnick, and participants at faculty workshops at the University of Pennsylvania, Boston University, UC Hastings, Villanova University, University of Chicago, and the Second Empirical Contracts Working Group provided useful feedback. Not all digital fine print exculpates liability: some exhorts users to perform before the consumer relationship has soured. We promise to choose strong passwords (and hold them private); to behave civilly on social networks; to refrain from streaming shows and sports; and to avoid reverse-engineering code (or, worse, deploying deadly bots). In short, consumers are apparently regulated by digital fine print, though it’s universally assumed that we don’t read it and, even if we did, that we’ll never be sued for failing to perform. On reflection, this ordinary phenomenon is perplexing. Why would firms persist in deploying uncommunicative behavioral spurs? The conventional answer is that fine print acts as an option, drafted by dull, guild-captured lawyers. Through investigation of several sharing-economy firms and discussions with a variety of lawyers in this space, I show that this account is incomplete. Indeed, I identify and explore examples of fine print from sharing-economy firms that seem intended to actually communicate with and manage users. The drafters of these clauses claim that they successfully deployed the fine print by trading on their brands and identities and by giving up on certain exculpatory defenses. I argue that the resulting terms may point toward a new form of relational contracting, taking on attributes of both mass adhesion contracts and longer-term deals. This option account proves too little. Descriptively, in many industries the value for the “option” would be vanishingly low, as the reputational costs for triggering it would be exceptionally high.25 Moreover, even if firms want to preserve their ex post options, why have they done so through a communicative medium that’s famously unread? Why haven’t they innovated to find ways to both corral their customers ex ante and also preserve their flexibility ex post? Some have argued that the current look and feel of the fine print is evidence of a market failure resulting from a monopoly: the organized bar. As imperfect—and badly trained—agents, lawyers simply can’t solve clients’ consumer contracting problems and repeatedly turn to the tools closest at hand.26 In other words: the fine print looks the way it does because lawyers have failed to innovate even though innovation would be valuable for their clients. Thus, we will have communicative contracts only in a world in which the gates around the profession are breached, and lawyers can join hands with accountants and engineers to build better forms. This story is also incomplete. In this Article, I challenge the conventional wisdom by providing examples of mass-market terms that seem to really influence user behavior outside of court. I do so through a series of interview-generated case studies of the user agreements from prominent new-economy firms, including Etsy, Airbnb, Tumblr, and Kickstarter. This is good news: it may suggest a distinct way forward in our understanding of the future of contracting online. Firms can innovate in this space, if they want to, and lawyers can help them do so. Close inspection of these innovative agreements suggests they might represent a new form of contracting, which I call “relational contracts of adhesion.” Unlike firms deploying typical, adhesive, mass-consumer contracts, these new firms actively try to motivate readership. In so doing, they hope to govern ex ante behavior without recourse to court sanctions, do not inevitably seize every advantage, harmonize the look and feel of the terms with their larger brands as an aspect of trade dress, and have seemingly succeeded in creating mass-market forms that have some of the attributes of “real” contracts. They are thus relational. This Article thus has several goals. First, I want to carve out precatory terms in adhesion contracts as the objects of study. Though consumer contracts have been discussed at length for decades, the degree to which they contain language that purports to persuade rather than compel has been largely ignored by contract theorists. Part I of this Article provides some examples of precatory terms in their fine-print context, and Part II pieces together the standard account for their continued existence. But the standard account is unconvincing. Part III offers a series of case study examples, based on interviews with market players, of precatory terms that seem to be functional in motivating user behavior outside of court. Part IV offers a theory that knits together these case studies and suggests that they illustrate a distinct form of relational contracting. The conditions giving rise to these contracts may suggest the need for different forms of government intervention in the sharing economy. To start, I confess to using the word precatory in an idiosyncratic sense. Ordinarily, precatory legal language has no legal effect at all28—for example, a clause in a will expressing the testator’s desires about her pet’s care.29 But some of the fine print I describe is in theory enforceable in court. For the purposes of this Article, I define precatory fine print as language in a mass-market contract that (1) is exceedingly unlikely to be enforced in court; (2) purports to govern the user’s conduct outside of the decision to purchase; and (3) introduces terms that the firm would like, all else equal, to see performed. I have already mentioned that intellectual property contracts are paradigmatic examples of precatory terms. These are both omnipresent and never enforced against consumers.30 Perhaps because of that lack of enforcement, there is little evidence that any consumer has been motivated by the terms and conditions of licensed intellectual property to avoid copying.31 It’s a puzzle. Here is a field in which the firm-side demand to regulate consumers—to have them behave differently—is high. However, though the underlying firms are innovative and dynamic players in a rapidly changing market, they have settled on a particularly inane strategy. Each imposes boilerplate prohibitions that are as hard to understand as they are to read from beginning to end. In considering each of these examples, we should ask: If firms really want consumers to do the things they are asking them to do, why would they use mass-market fine print to communicate their goals? And if they actually don’t care if consumers listen, why bother writing such terms at all? This Part considers the standard explanations for precatory fine print in the modern economy and finds them, in the end, incomplete. I start with some hopefully uncontroversial propositions about the relationship between terms and behavior. That is, we all know that some terms apply, and we may be behaviorally influenced by what we each imagine to be the rules of the road.63 To be concrete, when we agree to a user agreement before commenting online, perhaps we correctly intuit that the agreement tells us not to be a jerk and behave better as a result. However, even the most cutting-edge research has only begun to ask about individuals’ naïve views of consumer contract terms.64 It seems unlikely that firms know more. Thus, the best extant empirical evidence about how ordinary precatory fine print functions concludes that it doesn’t, at least with respect to ex ante behavioral regulation and deterrence. Given that terms are unread, why do firms waste the time drafting them? Most argue, in one form or another, that even if terms don’t affect behavior ex ante, they certainly can ex post. That claim is common with respect to terms that limit consumer rights: explicit terms make legal defenses stronger.69 However, the defense doesn’t require all terms to be litigated, and it acknowledges that in fact firms rarely insist on the actual language in their consumer contracts. Rather, the terms are used opportunistically, policing consumers on the margin.70 The fine print functions as an option. Perhaps we can attribute the lack of innovation in consumer contracts to a market failure created by a particular, villainous guild. It is possible that American lawyers—and the law schools that produce them—are to blame for the failure of consumer contracts to offer anything beyond option values for firms. It might be that in a world in which lawyers were forced to directly compete against other sorts of professional services, consumer contracts would be better tailored to firms’ needs (though the examples we see from less regulated jurisdictions don’t compel that point).104 But there are also reasons to be skeptical about an account that posits that lawyers are entirely to blame. [B]ehavioral restrictions that do not need to be specifically barred in the user agreement can be moved into a separate statement of community norms/standards. This way, users are told what they can do and not do, but the statement does not have the force of law. Ideally, other users can be given tools to help them enforce the community norms. Even better, the norms can be posted on a wiki so that the site’s users can help update them as the site’s community evolves. The next Part identifies a few firms that seem to have experimented in this vein. So far, I have described fine print that was traditional in both form and placement. That is, it wasn’t frontloaded in the contract but rather placed somewhere in its guts, and it looked and sounded like it was written by and for lawyers. I’ve suggested that conventional explanations for this phenomenon rest on either believing that there’s simply insufficient demand for communicative terms to make them worthwhile to produce or that, while demand exists, the market fails to match it because of the bar’s monopoly. In this Part, I provide some examples that together suggest these prevailing accounts are, if not wrong, then at least incomplete. Sometimes, firms create fine print that at least sounds like it was written by a human. Whether these counterexamples provide the exception to the rule, or its undoing, is a subject I take on later in the Article. To answer that question, I talked with numerous participants in the consumer contracts industry and was led to focus on a few platform economy firms that have written terms that appear to actually seek to communicate with, and influence, their users.117 Through a series of semistructured interviews, I asked general counsel at Tumblr, Kickstarter, and Etsy, as well as AirBnb and Bumble, how they came to write the terms they did and what they sought to gain.118 All are businesses that rely on participation by users, and all have cultivated relationships with their “community” that revolve, to one degree or another, around trust.119 So let us examine the mass contracts they created. [W]e expected [the users] to read the TOS (and interrogate us on any changes that were suspect). Part of that process was previewing TOS and policy changes and asking for feedback before launching them—which I personally responded to (and it was good feedback). In general we had established a relationship of trust between company and user in a number of ways and the TOS & policies were the written instantiation of that trust. I’d liken it to basic institution-building, something companies are usually awful at. This is why I didn’t, e.g., include one of those stupid class-action waivers or a mandatory arb[itration] clause even though they were considered “legal innovations” by the second update I did to the documents. Finally, let’s return to Bumble’s funny terms. Bumble is sometimes described as the “feminist Tinder.”194 But according to Miranda Lerner, a lawyer who was involved with its legal operations at its founding, Bumble sought at its launch to distinguish itself from Tinder.195 Lerner (and Wolfe, Bumble’s founder) resolved to use the new app’s TOS as a differentiation engine. What can we learn from these case studies? At the gross level, they provide examples of commercially important platform economy firms that appear to be using mass-market contracts in novel ways. At the very least, those contracts are functioning as extensions of the firms’ trade dress: they are more likely to (in Etsy’s words) “look and feel and reflect who we believe we are as a company.”205 But according to some of the drafters whose work we’ve studied, the terms’ ambition was larger: to actually enable user-participants to more easily read, learn from, and work with the terms in resolving disputes with each other. That is, the terms were intended to regulate. What the case studies do not do is provide a general theory explaining why it was these firms that innovated, nor do they do a very good job of predicting when innovation will next arise (if it does). After all, the vast majority of firms, including almost all new economy platform firms, have terms and conditions that are ordinary in form and function. The ultimate goal of this Part is to provide a set of research directions to help us better understand this space. Before doing so, I work to synthesize what we’ve learned so far. The changes were substantive. For the first three firms, the changes involved abandoning or not taking up remedial limitations and defenses to actions by users;212 for Airbnb, the changes increased the firm’s explicit responsibility for preventing discrimination.213 By adding translations, each firm also took on the risk that a court would interpret the translated text differently from the “legal” text. 214 By avoiding new exculpatory clauses while also adding a layer of uncertainty to the judicial reception of existing terms, all four firms thus increased their formal legal exposure. At the same time, each explicitly worked to avoid legalese and focus on simple, declarative sentences. All except for Airbnb also presented the terms with some playful humor and informality, as well as some visual cues and displays. As others, notably Professor Danielle Citron, have suggested, firms can enforce their TOS in a way that signals their allegiance to larger social campaigns,229 highlighting virtues and thus gaining reputational capital.230 For example, MySpace changed its TOS to ban certain kinds of speech and enforced those bans with aggressive moderation. These efforts helped the firm “by creating market niches and contributing to consumer goodwill.”231 Others, including Professor Robert Gomulkiewicz, have argued that firms should modulate the tone of their EULAs to “build goodwill with consumers.”232 But the idea that harmonizing the look and feel of terms can help make them functional has yet to be explored. Understanding how these terms work as extensions of the firm’s brand is jarring. There is something odd about the idea that hypermodern sharing economy firms try to advance their hipster credentials with that most antiquated behavioral tool of all: a contract. Indeed, the message can be easily confused: Bumble says, on the one hand, “We’re relaxed and hip enough to say that law is bunk,” but on the other hand, “Our lawyers insist that you are bound by bunk.”233 Airbnb may be seeking to put out a public relations fire by suggesting that it has a better way of communicating with users (though, in reality, it may not actually care if users read the policy). Thus, there is an element of false consciousness here: terms might be gaining user trust, and regulators’ approval, through a revision that in fact does little of substance. Unlike the in-house examples I discuss, Snapterms did not attempt to actually ensure that its terms were more readable (or read) than the alternative. Though it hired advertising copywriters to create humorous inserts, it did not test its product’s readability, or actual reader comprehension, in a scientific way.246 Snapterms borrowed some of its ideas for humor and explanatory phrases from other websites and did not attempt to tie its explanations into its clients’ brands or identity.247 Thus, it is unclear whether outsourcing is a viable solution to the no-reading problem. These stories show how weak, in the end, are explanations that blame lawyers for failures to innovate around terms. 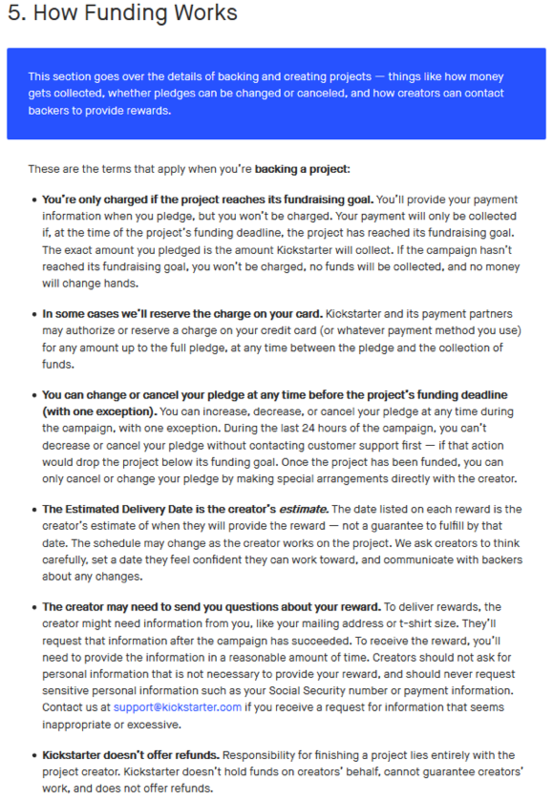 It was lawyers at Kickstarter, Etsy, and Tumblr (among others) who innovated around contracts in their respective firms and solved pressing business problems. They were not uniquely risk-seeking, even though they did come from the same New York–based entrepreneurial law community.248 That is, innovation and legal training are not incompatible. This account, then, suggests that the barrier to innovation isn’t lawyers’ training or risk aversion—or at least not primarily those factors. Rather, firms innovate and create terms that look functional when it is in their interest to do so. The set of cases in which those conditions hold is not zero, but it might be quite small. With this account of why and when precatory terms work in hand, we can turn our attention to considering how our case studies fit in the existing taxonomy of contract law and practice. To wildly oversimplify, that taxonomy can be thought of as starting with the nineteenth century’s classical contract: a fully negotiated contract between equally situated individuals. From that root came two great branches. The first is the modern commercial contract, marked by negotiation ex ante (at least some of the time), and reputationally determined performance goals and norms.262 Such contracts are intended to be read and to govern behavior while the parties’ relationship remains intact. The second branch is the classic consumer contract of adhesion.263 Consumer contracts are not negotiated ex ante, are offered on a take-it-or-leave-it basis, and (as I describe) function as discretionary options.264 The drafters of such contracts are aware that their terms will be unread by their mass adherents. The audience is ex post—largely for courts and secondarily for aggrieved consumers. How are terms usually enforced? Merchants or consumers: Categorizing platform counterparties as consumers or merchants may be one of the key legal and political questions of the digital age. It doesn’t seem fair to conclude that Etsy’s 1.9 million sellers265 (for example) are all “merchants” in the same way that firms in traditional consumer contracts are. For one, they may be buyers and sellers of items simultaneously, and for another, they may be hobbyists or individuals earning their livelihood. This is even truer for Tumblr, which attracts both professionals and those who simply seek to express themselves. Now, obviously, heavy users on each site are probably more like traditional merchants than they are like one-off consumers, but it’s not at all clear that such users were the exclusive audience for the revised tone and feel of terms that I discuss. How are terms enforced: Like ordinary consumer contracts, platform terms work in part through exclusion: users are thrown off sites for bad behavior, and terms (filtered through moderators and complaint systems) enable those sanctions to proceed smoothly. 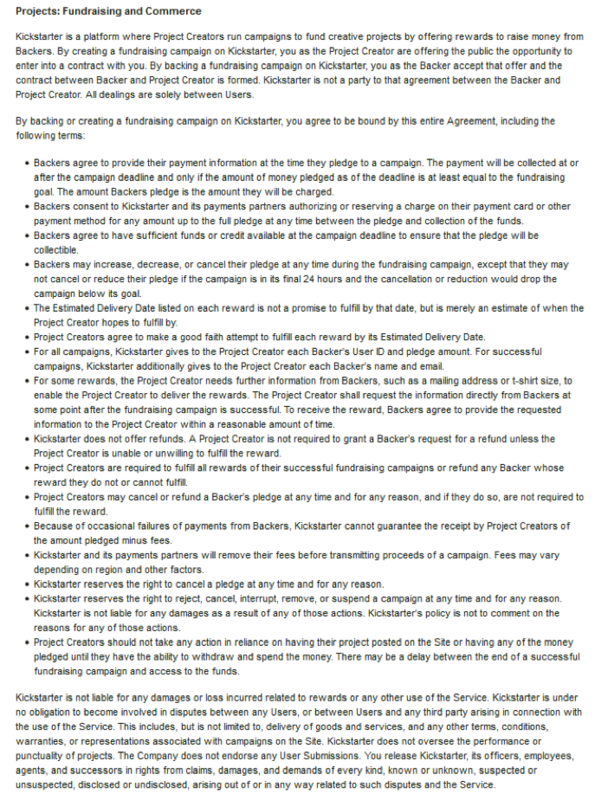 But unlike consumer contracts, the evidence I adduce suggests that platform contracts also succeed because at least some of their adherents read them, talk about them, and use them in dealing with one another. That is, the terms become a part of the reputational market on the platform. As with the traditional description of relational contracting, the governing contracts here are “not designed to create incentives for performance and breach primarily through the prospect of court-imposed monetary damages.”270 Performance is rather governed largely by users internalizing a set of rules created through brand alignment, informality, and interpersonal norms of reciprocity and fairness (thus, Bumble says, “[W]e’ve worked hard on our creation, so scraping or replicating any part of the App without our prior consent is expressly prohibited”).271 As Professor Oliver Hart has explained, reciprocity is a strong norm when the participants clearly understand what they are getting and giving:272 Etsy’s need to clarify the intellectual property rights that its platform takes (or doesn’t) thus was a crucial part of its reform process. When soft norms fail, even in relational contracting systems, firms retain the ability to use a heavier hand. Here, our case study firms start their sanctions with rating-based complaint systems, escalate to suasion by site moderators, and finally exclude bad users from the marketplace entirely. But those systems can be overstrained: as the case studies show, firms innovated here in part because their customer service representatives needed a break from noncompliant users, who needed to be better convinced that they were in a relationship of trust and reciprocity. In this way, we can see the relational contracts here as solving a business problem: they needed to keep users engaged, on task, and willing to contribute to a larger platform economy. Authors selling normative prescriptions standing on a limited number of case studies should be distrusted. This Section, cognizant of the strength of the evidence on which it rests, will make two observations and then pose a series of hopefully orientating questions about the nature of future research into the functioning of mass contracts. First, an implicit premise of this Article is that contract theorists should treat precatory terms and exculpatory terms as distinct objects of study. To date, they have not, all but ignoring precatory terms.278 But if contract (particularly consumer contract) theory is to become realistic, we ought to revisit our accounts of contracting to deal with the fact that many terms in adhesive mass-market contracts purport to extend the performance obligation beyond the point of purchase, and yet are obviously not intended to have legal force. The evidence I adduce tends to discredit accounts that deem these terms to be inert as a product of a monopolistic bar’s failure to innovate. Precatory terms do have multiple functions. The most obvious one—options to enable the firm to manage unruly users—is underdeveloped in the literature, which generally focuses on bad behavior by firms, not their customers. But they also, it seems, can help to build firms’ brands and can even help the firms to coordinate user behavior and keep users engaged with the platform. The degree to which the latter functions have wide appeal is highly debatable: this Article simply can tell us that some firms, some of the time, justify costly innovation with precisely this claim to utility. Second, the case studies suggest that scholars might have missed a potential way that disclosure could be made functional. When trying to solve the problem of aversive, unread, exculpatory terms, many modern thinkers have pushed a solution designed to remedy cognitive problems of information overload.279 For example, some advocate for smart disclosure mandates like warning boxes that stand out with unexpected terms,280 or graphical warning labels for terms that are particularly unfair.281 The consumer contract problem is conceived of as a problem of mandating the precisely right disclosures because it is assumed that firms always lack incentives to encourage readership. The examples of success that I provide here suggest the possible futility of even sophisticated disclosure regimes.282 Each of the case studies suggests that terms exhort when they are trusted, built from the ground up with buy-in from the firm’s users, and fit with the brand. Or to put it differently, the case studies might be thought of as a market test of the question of how to encourage mass readership. Firms selected brands over labels. Scholars might follow this path (through experiments or otherwise) to see if informality and brand alignment increase comprehension and use of terms. Relatedly, the theory I lay out is highly reliant on stories told by particular firms’ lawyers, who wrote the contracts in question, spent time justifying them to other stakeholders, and clearly have an interest in being portrayed as both progressive and innovative. Indeed, I gave the lawyers permission to read and edit their quoted comments before this Article’s circulation, and any direct quotes they believed reflected badly on them would not have survived such an inquiry. It is interesting, and perhaps telling, that none of the general counsel I spoke to provided hard data about readership rates or designed systems to rigorously evaluate their modified terms’ behavioral effects.286 That is not to say that the lawyers I spoke to were deceiving (me or themselves). Rather, to the extent that part of the story I tell is one of contract as marketing, we ought to be wary of taking more grand claims of behavioral influence at face value. If we were to become convinced that relational contracts of adhesion were influencing users to read and use their contracts, further qualitative and quantitative study might suggest the limits of users’ acquiescence to the regulatory regime: Is buy-in stronger with those who make more money on the site? Who have been there longer? Who commented on the terms in their drafting? The apparent reticence of firms like Airbnb to ask probing questions of their users suggests that not all firms will be equally able to affect behavior or want to learn about it. Similarly, to what extent is success here a product of rarity: If all firms’ terms looked as cute as Etsy’s, would users become numb? Obviously, only a few firms have user terms that look anything like the ones I’ve studied. Why is that? Are relational contracts of adhesion limited to circumstances in which users are also merchants? To firms pressed on the problem when they were small enough to care but big enough to invest? To firms born in New York City? Near Union Square? A research project that looked at those firms that did not innovate, though they had the opportunity to do so, might help to provide clarity on these issues. It’s dangerous to generalize from case studies, let alone ones that valorize their subjects. This Article can merely claim that not all mass-market contracts look the same, and they might not function identically, either. Some might be changing user behavior by drawing on practices (of reciprocity, informality, and trust) traditionally sourced to individualized, negotiated, off-line deals. The challenge going forward is to understand better what role the law and legal institutions play in creating innovation around such relational contracts of adhesion. 1. For the modern classic treatment, see Ian Ayres and Alan Schwartz, The No-Reading Problem in Consumer Contract Law, 66 Stan L Rev 545, 558–60 (2014). 2. See, for example, Yannis Bakos, Florencia Marotta-Wurgler, and David R. Trossen, Does Anyone Read the Fine Print? Consumer Attention to Standard-Form Contracts, 43 J Legal Stud 1, 19 (2014) (finding that, in a study of visits to software retailers’ websites, consumers accessed end-user license agreements (EULAs) 0.08 percent of the time). 3. See Florencia Marotta-Wurgler, Does Contract Disclosure Matter?, 168 J Inst & Theoretical Econ 94, 113–14 (2012) (finding that exposure to a one-sided term in a software license agreement has no effect on the likelihood of purchasing the product in question); Daniel Schwarcz, Reevaluating Standardized Insurance Policies, 78 U Chi L Rev 1263, 1315–17 (2011) (explaining the concern that insurance companies “exploit[ ] consumer ignorance to ratchet back coverage” without corresponding discounts). 4. See Florencia Marotta-Wurgler and Robert Taylor, Set in Stone? Change and Innovation in Consumer Standard-Form Contracts, 88 NYU L Rev 240, 247 (2013) (discussing the process of consumer contract creation, through which in-house counsel is best positioned to revise boilerplate language and language taken from other firms). 5. In reality, many consumers complain to firms without the benefit of counsel (because the stakes of the dispute are low). In such instances, the corporation may create its own idiosyncratic dispute resolution system. See Rory Van Loo, The Corporation as Courthouse, 33 Yale J Reg 547, 558–66 (2016) (explaining predominant aspects of corporate dispute resolution systems); Lisa Bernstein and Hagay Volvovsky, Not What You Wanted to Know: The Real Deal and the Paper Deal in Consumer Contracts—Comment on the Work of Florencia Marotta-Wurgler, 11 Jerusalem Rev Legal Stud 128, 130–32 (2015) (explaining that companies’ actual practices for resolving consumer complaints can differ from their formal policies in ways that have the effect of avoiding litigation); Jason Scott Johnston, The Return of Bargain: An Economic Theory of How Standard-Form Contracts Enable Cooperative Negotiation between Businesses and Consumers, 104 Mich L Rev 857, 865 (2006) (highlighting corporations’ use of employee discretion in departing from formal contractual terms). 6. See Tess Wilkinson-Ryan, A Psychological Account of Consent to Fine Print, 99 Iowa L Rev 1745, 1764–65 (2014) (presenting results of an experiment in which subjects often blamed consumers for failing to read bad terms). 7. See, for example, Tess Wilkinson-Ryan, The Perverse Consequences of Disclosing Standard Terms, 103 Cornell L Rev 117, 124–26 (2017) (discussing various doctrinal approaches to the no-reading problem); David A. Hoffman, From Promise to Form: How Contracting Online Changes Consumers, 91 NYU L Rev 1595, 1597 (2016) (characterizing digital contracts as sterile and frequently the subject of satire); Nathan B. Oman, The Dignity of Commerce: Markets and the Moral Foundations of Contract Law 134–59 (Chicago 2016) (considering arguments regarding consent for consumer boilerplate and concluding that policing on substance, not process, is desirable); Omri Ben-Shahar, Book Review, Regulating through Boilerplate: An Apologia, 112 Mich L Rev 883, 900–01 (2014) (highlighting distributive problems with “protective policies” meant to replace boilerplate contracts); Oren Bar-Gill and Ryan Bubb, Credit Card Pricing: The CARD Act and Beyond, 97 Cornell L Rev 967, 1003 (2012) (advocating for new and better disclosure regimes, including aggregated fee information, which the consumer can better assess); Zev J. Eigen, Experimental Evidence of the Relationship between Reading the Fine Print and Performance of Form-Contract Terms, 168 J Inst & Theoretical Econ 124, 134 (2012) (citing the “low stakes of the exchange” as one of the “typical” explanations of low readership); Victoria C. Plaut and Robert P. Bartlett III, Blind Consent? A Social Psychological Investigation of Non-Readership of Click-Through Agreements, 36 L & Hum Behav 293, 305–06 (2012) (exploring the relationship between lack of readership and assent to contractual provisions); Omri Ben-Shahar and Carl E. Schneider, The Failure of Mandated Disclosure, 159 U Pa L Rev 647, 704–11 (2011) (exploring the problem of no-reading); Oren Bar-Gill and Kevin Davis, Empty Promises, 84 S Cal L Rev 1, 19–26 (2010) (articulating problems caused by unilateral modification clauses); Oren Bar-Gill, Seduction by Plastic, 98 Nw U L Rev 1373, 1417–20 (2004) (advocating for consumer-friendly modifications to credit card fee disclosure policies). 8. See Gillian K. Hadfield, Rules for a Flat World: Why Humans Invented Law and How to Reinvent It for a Complex Global Economy 154 (Oxford 2017) (discussing the complexity of monitoring copying of digital information, such as music and videos, when the “boundary between who is a supplier and who is a consumer dissolves,” and how relaxed restrictions on copying can enable consumers to become creators). The question of labeling users of sharing economy sites as “consumers” is intensely contested. See Ryan Calo and Alex Rosenblat, The Taking Economy: Uber, Information, and Power, 117 Colum L Rev 1623, 1660 (2017) (arguing that labeling drivers as consumers is part of Uber’s strategy of exploiting them). 9. In this Article, I generally use “consumer” to refer to users of platform economy sites, though those individuals may be either buyers or sellers. See Hadfield, Rules for a Flat World at 154 (cited in note 8). 10. The literature on the sharing economy is vast. For a useful recent survey, see Calo and Rosenblat, 117 Colum L Rev at 1641–45 (cited in note 8) (describing the promise of the sharing economy). 13. See Guy A. Rub, Copyright Survives: Rethinking the Copyright-Contract Conflict, 103 Va L Rev 1141, 1198, 1203 (2017) (describing common “super-copyright” contractual provisions that preclude fair use of copyrighted material). 15. See Zev J. Eigen, An Experimental Test of the Effectiveness of Terms & Conditions *3 (Northwestern Law & Economics Research Paper No 13-32), archived at http://perma.cc/7D9Y-ZB7K. 16. This is a mistake, even if George R.R. Martin will never, ever finish writing the series. See Hoffman, 91 NYU L Rev at 1599 n 15 (cited in note 7) (explaining the problem of fantasy authors promising too much). 20. Admit it, you got bored and stopped reading. And I excised around 100 words from the middle just to make it easier for you. 21. See Jenna Wortham, The Unrepentant Bootlegger (NY Times Sept 27, 2014), online at http://www.nytimes.com/2014/09/28/technology/the-unrepentant-bootlegger.html (visited Mar 31, 2018) (Perma archive unavailable). 22. See Eigen, An Experimental Test at *22–23 (cited in note 15) (finding that terms and conditions induced more cheating than other forms of behavioral modification). 23. See Lucian A. Bebchuk and Richard A. Posner, One-Sided Contracts in Competitive Consumer Markets, 104 Mich L Rev 827, 833–34 (2006) (describing how firms “dependably treat consumers much better than their contracts require them to do” in response to consumer expectations). 25. The Recording Industry Association of America, for example, abandoned its campaign to sue users for downloading music after it became a “public-relations disaster.” Sarah McBride and Ethan Smith, Music Industry to Abandon Mass Suits (Wall St J, Dec 19, 2008), online at http://www.wsj.com/articles/SB122966038836021137 (visited Mar 31, 2018) (Perma archive unavailable). Even threats to sue can be disastrous. The “Streisand Effect” was a term coined by Mike Masnick in 2005 to explain how attempts to remove information from the internet frequently cause that information to become even more salient. See Mike Masnick, For 10 Years Everyone’s Been Using “The Streisand Effect” without Paying; Now I’m Going to Start Issuing Takedowns (TechDirt, Jan 8, 2015), archived at http://perma.cc/4WMX-2VYT. 26. See Hadfield, Rules for a Flat World at 228–37 (cited in note 8) (blaming the bar monopoly for law schools’ and lawyers’ failure to innovate around terms); Eigen, An Experimental Test at *3–5 (cited in note 15) (noting lawyers’ risk aversion as a driver of the failure to innovate). 27. See, for example, Calo and Rosenblat, 117 Colum L Rev at 1660–61 (cited in note 8) (arguing that contracting is a way that firms like Uber exploit their drivers). 28. Black’s Law Dictionary 1366 (10th ed 2014) (defining “precatory word[s]” as “expressions of requests, desires, or recommendations, as distinguished from commands” and noting that “[g]enerally, precatory words are not recognized as legally enforceable instructions”). 29. See Alyssa A. DiRusso, He Says, She Asks: Gender, Language, and the Law of Precatory Words in Wills, 22 Wis Women’s L J 1, 16 (2007) (describing precatory language in wills concerning pets). 30. Rub, 103 Va L Rev at 1184–91 (cited in note 13) (discussing the set of doctrinal and practical hurdles to using contracts to enforce anticopying rules). 31. See id at 1198. -france.html (visited Apr 11, 2018) (Perma link unavailable). 33. Jeffrey Rosen, This Hate Has Been Removed by the Administrator, New Republic 22 (May 13, 2013). See also Danielle Keats Citron, Extremist Speech, Compelled Conformity, and Censorship Creep, 93 Notre Dame L Rev 1035, 1038 (2018) (describing transnational problems of private speech in TOS enforcement). See also generally Kate Klonick, The New Governors: The People, Rules, and Processes Governing Online Speech, 131 Harv L Rev 1598 (2018) (describing content moderation). 36. Terms and Conditions (Birchbox, 2017), archived at http://perma.cc/BGN5-NY2Y. 37. Lucille M. Ponte, Protecting Brand Image or Gaming the System? Consumer “Gag” Contracts in an Age of Crowdsourced Ratings and Reviews, 7 Wm & Mary Bus L Rev 59, 92 (2016) (“[T]he posting of a single negative review online could cause business revenues to plummet about 25 percent or more.”). 38. See Eric Goldman, Understanding the Consumer Review Fairness Act of 2016, 24 Mich Telecom & Tech L Rev 1, 2–4 (2017) (describing the history of antireview clauses and explaining that some firms use these clauses to impose monetary fines on consumers). 39. Pub L No 114-258, 130 Stat 1355 (2016), codified at 15 USC § 45b. 40. 15 USC § 45b. 41. Professor Danielle Citron prompts me to wonder whether the rejection of review clauses is instead an illustration of our free speech tradition. See Danielle Keats Citron, Hate Crimes in Cyberspace 199–218 (Harvard 2016) (discussing various forms of cyber harassment in the context of the First Amendment). Yet the absence of a similar public outcry against common confidentiality clauses, which are more seriously negotiated but which cause similar deprivation of market-relevant information, seems telling. legal/user-agreement (visited Mar 31, 2018) (Perma archive unavailable). 44. Zipcar Membership Contract—Floating Model (Zipcar Belgium, Aug 19, 2016), archived at http://perma.cc/BZL3-WKAH. 46. Terms and Conditions (Feastly, Oct 23, 2014), archived at http://perma.cc/289E-6TZ9. 47. 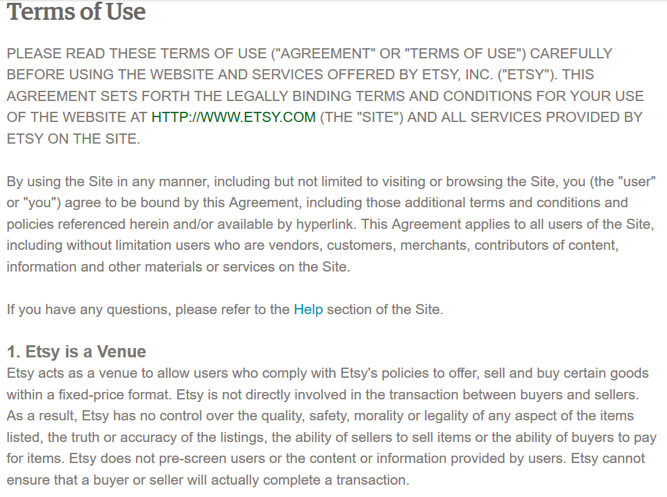 TaskRabbit Terms of Service (TaskRabbit, Mar 1, 2016), archived at http://perma.cc/5CW4-94A8. 49. Box Terms of Service (Box, Aug 1, 2017), archived at http://perma.cc/UX42-NZQ9. Notably, another product with the similar name of DropBox Inc does offer services directly to nuclear facilities, by way of a large, metal toilet. DropBox Inc. and the Sanitation Station. Portable Restroom Trailers (Sept 28, 2012), available at http://perma.cc/6KCR-QYBQ. 50. For an illustrative paper, see generally Alan Schwartz and Robert E. Scott, Contract Theory and the Limits of Contract Law, 113 Yale L J 541 (2003). Schwartz and Scott discuss an efficiency theory of firm-firm contracting, pointing out that court involvement would be limited as most contracts would be self-enforcing. Id at 556–59. It’s just as axiomatic that marking the parties’ obligations isn’t the only thing that “contract” does. See Mark C. Suchman, The Contract as Social Artifact, 37 L & Society Rev 91, 91 (2003) (“Contracts are many things to many people.”). 51. See Suchman, 37 L & Society Rev at 112 (cited in note 50) (providing an account of contract as a “significant gesture” that “allow[s] transacting parties to communicate messages to one another or to third-party observers”). 52. For examples and lucid analysis, see Alan Schwartz and Robert E. Scott, The Common Law of Contract and the Default Rule Project, 102 Va L Rev 1523, 1577–85 (2016). 53. This is not to say that each term is perfectly performed or that legal sanctions are necessary, as reputational concerns play important roles. For example, see Lisa Bernstein, Private Commercial Law in the Cotton Industry: Creating Cooperation through Rules, Norms and Institutions, 99 Mich L Rev 1724, 1767 (2001) (describing the role of trade associations in creating effective reputational constraints); Stewart Macaulay, Non-Contractual Relations in Business: A Preliminary Study, 28 Am Sociological Rev 55, 63–65 (1963) (discussing reputation-based “non-legal sanctions” that often take the place of formal contract terms). 54. See, for example, Daniel Markovits and Alan Schwartz, The Myth of Efficient Breach: New Defenses of the Expectation Interest, 97 Va L Rev 1939, 1954–55 n 32 (2011) (arguing that firms are more likely to maximize monetary returns in contracts than individuals); Margaret Jane Radin, Regulation by Contract, Regulation by Machine, 160 J Inst & Theoretical Econ 142, 145 (2004) (imagining a world of “efficacious” consumer contracts). 56. In many market segments, warranties are subject to strong market forces. See Yair Listokin, The Meaning of Contractual Silence: A Field Experiment, 2 J Legal Analysis 397, 406–10 (2010) (reporting findings that consumers correctly priced variations in warranty language); George L. Priest, A Theory of the Consumer Product Warranty, 90 Yale L J 1297, 1347 (1981) (“[T]he allocation of responsibilities . . . by standardized warranties is responsive to consumer preferences, and establishes coherent economic incentives for manufacturer and consumer investments.”). The two leading Federal Trade Commission studies on warranty readership (though dated) find that, generally, between 20 and 30 percent of consumers read warranties before they purchased a good, and between 50 and 80 percent read after purchase. Arthur Young & Co, Warranties Rules Consumer Baseline Study: Final Report 58 (Federal Trade Commission 1979) (28.4 percent of all survey respondents read warranty prepurchase). These numbers provide evidence of readership rates, at least in the paper warranty context, orders of magnitudes higher than ordinary consumer contract fine print. Another datum comes from Robert A. Hillman, Online Consumer Standard Form Contracting Practices: A Survey and Discussion of Legal Implications, in Jane K. Winn, ed, Consumer Protection in the Age of the “Information Economy” 283, 290–92 (Ashgate 2006) (reporting survey findings that of the minority of law student respondents who responded that they might read terms beyond price and description, nearly all did so to look at warranty descriptions). Generally speaking, consumers are more likely to read warranties ex post than ex ante. See Shmuel I. Becher and Tal Z. Zarsky, E-Contract Doctrine 2.0: Standard Form Contracting in the Age of Online User Participation, 14 Mich Telecom & Tech L Rev 303, 316 (2008) (arguing that scholars should more readily distinguish ex post and ex ante readership). 57. See Bakos, Marotta-Wurgler, and Trossen, 43 J Legal Stud at 19–22 (cited in note 2); Florencia Marotta-Wurgler, Will Increased Disclosure Help? Evaluating the Recommendations of the ALI’s “Principles of the Law of Software Contracts”, 78 U Chi L Rev 165, 179–81 (2011). 58. See Arthur Allen Leff, Contract as Thing, 19 Am U L Rev 131, 146–47 (1970) (characterizing adhesion contracts as just one part of “a unitary, purchased bundle”). 59. See, for example, Florencia Marotta-Wurgler, Competition and the Quality of Standard Form Contracts: The Case of Software License Agreements, 5 J Empirical Legal Stud 447, 451 (2008) (concluding that “there is no evidence” that “greater market power is associated with more pro-seller standard terms”). Field experiment data is generally in accord. See, for example, Enrique Seira, Alan Elizondo, and Eduardo Laguna-Müggenburg, Are Information Disclosures Effective? Evidence from the Credit Card Market, 9 Am Econ J: Econ Pol 277, 291–98 (2017) (finding very small or negative effects of personalized disclosures on credit card account holders’ behavior in a large randomized control trial); Bruno Ferman, Reading the Fine Print: Information Disclosure in the Brazilian Credit Card Market, 62 Management Science 3534, 3545 (2016) (reporting that, in a randomized field experiment, more salient disclosure of credit card interest rates did not affect consumer behavior except in high-risk clients); Sumit Agarwal, et al, Regulating Consumer Financial Products: Evidence from Credit Cards, 130 Q J Econ 111, 147–52 (2015) (finding that the effect of a “months-to-payoff” disclosure could not be precisely estimated). 60. Wilkinson-Ryan, 103 Cornell L Rev at 165 (cited in note 7). 61. Nancy S. Kim, Web Site Proprietorship and Online Harassment, 2009 Utah L Rev 993, 1015. 62. Id. But see David A. Hoffman and Zev J. Eigen, Contract Consideration and Behavior, 85 Geo Wash L Rev 351, 385–88 (2017) (noting the lack of evidence of changed user behavior resulting from user consent to ostensibly legally binding agreements and arguing for new forms of formation formality); Monika Leszczyńska, Think Twice before You Sign! An Experiment on a Cautionary Function of Contract Formalities *12 (unpublished manuscript, Sept 26, 2016), archived at http://perma.cc/8CBF-MD94 (reporting survey findings that individuals acted more impulsively when clicking a box than when signing their name during interactions with websites’ forms). 63. Wilkinson-Ryan provides some evidence in support of this hypothesis. Wilkinson-Ryan, 103 Cornell L Rev at 164–65 (cited in note 7). See also Ayres and Schwartz, 66 Stan L Rev at 600–01 (cited in note 1) (discussing divergent consumer views as to what privacy policies say); Eigen, 168 J Inst & Theoretical Econ at 135–37 (cited in note 7) (showing that, as individuals spent more time reading the contract ex ante, they were more likely to perform in accordance with its terms ex post). This sort of intuition gives rise to the famously unsuccessful Restatement (Second) of Contracts § 211, otherwise known as the reasonable expectations doctrine. As the Restatement puts it, “Although customers typically adhere to standardized agreements and are bound by them without even appearing to know the standard terms in detail, they are not bound to unknown terms which are beyond the range of reasonable expectation.” Restatement (Second) of Contracts, § 211(f) (1979). 64. There are a number of papers that discuss the terms that consumers expect, but which do not focus on performance obligations. For example, consumers do not seem to accurately recall the presence of certain clauses in some consumer contracts. See, for example, Jeff Sovern, et al, “Whimsy Little Contracts” with Unexpected Consequences: An Empirical Analysis of Consumer Understanding of Arbitration Agreements, 75 Md L Rev 1, 41 (2015) (reporting survey results in which few consumers recalled seeing an arbitration agreement in a contract that contained one); Debra Pogrund Stark, Jessica M. Choplin, and Eileen Linnabery, Dysfunctional Contracts and the Laws and Practices That Enable Them: An Empirical Analysis, 46 Ind L Rev 797, 813–20 (2013) (reporting survey findings showing that real estate consumers exhibited a poor understanding of waivers of remedies); Zev J. Eigen, The Devil in the Details: The Interrelationship among Citizenship, Rule of Law and Form-Adhesive Contracts, 41 Conn L Rev 381, 414–16 (2008) (reporting survey results in which only 17 percent of an employee sample recalled that an employment agreement they signed contained an arbitration clause). There is a more robust literature about naïve views of legal rules outside of contract. For example, see Gregory N. Mandel, Anne A. Fast, and Kristina R. Olson, Intellectual Property Law’s Plagiarism Fallacy, 2015 BYU L Rev 915, 946–47 (reporting experimental results on individuals’ incorrect views about the content of intellectual property law). 65. For general discussion of a type of blowback, see Ethan J. Leib and Zev J. Eigen, Consumer Form Contracting in the Age of Mechanical Reproduction: The Unread and the Undead, 2017 U Ill L Rev 65, 101–02. 66. See id at 79 (“The more we fail to resist zombie [boilerplate] contracts, the easier it is for drafting entities to assert that they hold a reasonable belief that individuals manifesting assent to terms would still do so, even in the face of more and more rights-encroaching terms.”). 67. It is hard to find data that supports or refutes the idea that individuals’ subjective expectations of contract terms have changed. And yet, in the 1980s, for example, forum selection clauses were seen as controversial and seemingly limited to negotiated deals. However, over time (helped by the Supreme Court) they have become anodyne. See Carnival Cruise Lines v Shute, 499 US 585, 593–94 (1991) (broadening the enforceability of standardized forum selection clauses in large part because they save litigation costs). 68. For one, it might not work! There is evidence from the privacy context that subjective views about Fourth Amendment privacy may be relatively fixed. See Matthew B. Kugler and Lior Jacob Strahilevitz, The Myth of Fourth Amendment Circularity, 84 U Chi L Rev 1747, 1794–95 (2017) (finding that, while Supreme Court decisions had short-term effects on the public’s views on lawful surveillance, these effects disappeared over time). After reading a copy of this Article, Professor Danielle Citron, however, suggested to me that Facebook’s real name policy might be an example of a firm with just such a long-term commitment in mind, based on Mark Zuckerberg’s personal commitments. 69. Eigen, An Experimental Test at *5 (cited in note 15) (describing the common notion that, without media use contracts, “companies would be left with greater costs of policing implied contractual rights in court, instead of being able to rely on the explicit wording of the ‘fine print’”). 70. Bebchuk and Posner, 104 Mich L Rev at 833–34 (cited in note 23) (describing how firms use their contractual terms to enforce policies against consumers who do not act in good faith). See also Johnston, 104 Mich L Rev at 877 (cited in note 5) (“The strategy of allowing employees the discretion to grant case-specific benefits beyond those that are required by the standard-form contract can be seen to be a sophisticated way for the firm to grow its revenues.”). 71. See generally Bebchuk and Posner, 104 Mich L Rev 827 (cited in note 23). 74. See, for example, George S. Geis, Book Review, Economics as Context for Contract Law, 75 U Chi L Rev 569, 585–86 (2008) (explaining the importance of option theory to contract law); Robert E. Scott and George G. Triantis, Embedded Options and the Case against Compensation in Contract Law, 104 Colum L Rev 1428, 1460 (2004) (describing the option to behave opportunistically as a valuable part of contracting). 75. See Ammori, 127 Harv L Rev at 2274–78 (cited in note 32) (describing the implementation of speech codes contained in TOS at various digital companies through “private jurisprudence”). 76. But see Kim, 2009 Utah L Rev at 1028–29 n 144 (cited in note 61) (noting that a firm was investigated for consumer fraud for failing to enforce its own terms and conditions against abuse and subsequently changed its terms). The fact that most actions against firms that ban content that is barred by their TOS fail on § 230 grounds makes the marginal legal utility of TOS particularly puzzling. See 47 USC § 230(c)(2)(A) (“No provider or user of an interactive computer service shall be held liable on account of any action voluntarily taken in good faith to restrict access to or availability of material that the provider or user considers to be . . . objectionable.”). 77. See Ponte, 7 Wm & Mary Bus L Rev at 78–79 (cited in note 37) (“Often, nondisparagement provisions are framed in a manner that keeps the primary focus on the business investment in the brand’s development and establishment of its goodwill in the marketplace, while obscuring the effort to limit consumer speech.”). See also Becher and Zarsky, 14 Mich Telecom & Tech L Rev at 322–28 (cited in note 56) (discussing ways that consumers learn of terms ex post). 78. See Meirav Furth-Matzkin, On the Unexpected Use of Unenforceable Contract Terms: Evidence from the Residential Rental Market, 9 J Legal Analysis 1, 41–42 (2017) (noting that, when contracts include “unenforceable and misleading terms,” consumers who are unfamiliar with the law may rationally believe that terms are enforceable and binding when they are not); Wilkinson-Ryan, 103 Cornell L Rev at 121 (cited in note 7) (arguing that firms use boilerplate because it may chill complaints); Dennis P. Stolle and Andrew J. Slain, Standard Form Contracts and Contract Schemas: A Preliminary Investigation of the Effects of Exculpatory Clauses on Consumers’ Propensity to Sue, 15 Behav Sci & L 83, 91–92 (1997) (reporting survey findings that “the presence of [boilerplate] exculpatory language did have a deterrent effect on participants’ propensity to seek compensation”). 80. 86 F3d 1447 (7th Cir 1996). 82. See Citron, Hate Crimes in Cyberspace at 169–72 (cited in note 41). 83. As Ed Ferguson, Vice President and Associate General Counsel at IAC, and Michael Cheah, General Counsel at Vimeo, explained to me, the TOS provide protection for the firm—the freedom of action to exclude users or manage disputes. Telephone Interview with Ed Ferguson and Michael Cheah (Apr 28, 2017) (“Interview with Ed Ferguson and Michael Cheah”) (on file with author). 84. See Feldman & Teichman, 100 Georgetown L J at 31, 49 (cited in note 55) (discounting the option explanation after experimental study about individual motivations). Professor Guy Rub, in a survey of 279 reported decisions analyzing the copyright/contract nexus, found no examples of a consumer sued for breach of an intellectual property standard form contract. Rub, 103 Va L Rev at 1198 (cited in note 13). -buy-your-own-phone-1424807865 (visited Mar 31, 2018) (Perma archive unavailable) (“Without much thought, I did what most Americans do every two years: I agreed to be locked in by a multibillion-dollar wireless company.”). 86. See, for example, Hoffman, 91 NYU L Rev at 1639 n 189 (cited in note 7) (discussing firm innovation around dynamic webpages that utilize data about prospective customers with the goal of encouraging them to shop); Robert W. Gomulkiewicz, Getting Serious about User-Friendly Mass Market Licensing for Software, 12 Geo Mason L Rev 687, 695–96 (2004) (describing the benefits to firms of creating contracts that consumers can understand ex ante, which include building goodwill and ensuring that consumers do not exceed the scope of their rights). 87. See Joshua Fairfield, The Cost of Consent: Optimal Standardization in the Law of Contract, 58 Emory L J 1401, 1409 (2009) (noting that lawyers reuse language to “save themselves drafting costs, economize on learning costs, reuse ‘safe’ language that has been vetted by courts, and signal to prospective counterparties that the contract drafter does not seek an unfair advantage”). 88. See Hadfield, Rules for a Flat World at 228–37 (cited in note 8) (“[A] system based on this level of uniformity in thinking is an almost impossible environment for transformative change.”). 89. See Eric A. Zacks, Contract Review: Cognitive Bias, Moral Hazard, and Situational Pressure, 9 Ohio St Entrepreneurial Bus L J 379, 417 (2015) (explaining that the desire to please the client induces an attorney “to revise the contract in a manner that minimizes the possibility of the revisions disrupting the transaction”). 90. See Marcel Kahan and Michael Klausner, Standardization and Innovation in Corporate Contracting (or “The Economics of Boilerplate”), 83 Va L Rev 713, 725–27 (1997) (describing “network benefits” as a “set of advantages . . . available to a firm that adopts a contract term that is or will become contemporaneously used by many firms for a significant period of time”). 91. Eigen, An Experimental Test at *4 (cited in note 15). 92. See Calo, 87 Notre Dame L Rev at 1030 (cited in note 24) (“Visceral notice . . . does not necessarily rely on describing practices in language or symbols. Rather, it leverages a consumer’s very experience of a product or service to warn or inform.”). 93. Though lawyers are traditionally seen as risk averse with respect to new technologies, they are often also criticized for taking risks by drafting to the edge of what’s enforceable. Sometimes, we can’t win. See Study of Uniform Commercial Code Memoranda Presented to the Commission and Stenographic Report of Public Hearing on Article 2 of the Code, NY State Law Revision Commission, Legislative Doc No 65 at 177 (1954) (statement of Professor Karl Llewellyn) (“Any engineer makes his construction within a margin of safety, and a wide margin of safety, so that he knows for sure that he is getting what he is gunning for. The practice of business lawyers has been, however . . . to draft . . . to the edge of the possible.”). 94. Eigen, An Experimental Test at *4 (cited in note 15). 95. See, for example, Royce de R. Barondes, The Business Lawyer as Terrorist Transaction Cost Engineer, 69 Fordham L Rev 31, 52 (2000) (describing how drafting hidden contractual terms impacts lawyers’ reputations even when they are actually advancing clients’ interests); Scott Edward Walker, Top 10 Reasons Why Entrepreneurs Hate Lawyers (Venture Hacks, Jan 14, 2010), archived at http://perma.cc/256G-BU2M (including “overlawyering” by using a “one-size-fits-all approach to deals” in a list of reasons why entrepreneurs hate lawyers). 96. Hadfield, Rules for a Flat World at 188 (cited in note 8). 99. Email from Ari Shahdadi to David A. Hoffman (Mar 22, 2017, 3:08 pm EDT) (“Email from Ari Shahdadi, 3:08 pm”) (on file with author). 100. Email from Ari Shahdadi to David A. Hoffman (Mar 22, 2017, 5:45 pm EDT) (“Email from Ari Shahdadi, 5:45 pm”) (on file with author). 101. Telephone Interview with Michal Rosenn (Mar 24, 2017) (“Interview with Michal Rosenn”) (on file with author). 102. Email from Bonnie Broeren, Head of Policy, Etsy, to David A. Hoffman (Mar 28, 2017, 2:17 pm EDT) (“Email from Bonnie Broeren, 2:17 pm”) (on file with author), quoting Matthew Glick, Senior Product and Commercial Counsel, Etsy. 103. Telephone Interview with Hissan Bajwa, former senior counsel, Etsy (Apr 4, 2017) (“Interview with Hissan Bajwa”) (on file with author). 104. Notably, though lawyers abroad face fewer barriers to competition, they have not produced (to my knowledge) distinctively communicative legal terms. That’s true, although “new types of business models for legal work” are flourishing, including “joint venture[s] between lawyers, software engineers, and business experts.” Hadfield, Rules for a Flat World at 241–45 (cited in note 8) (offering a description of the UK’s deregulatory system). 105. Chris Mondics, A Pioneer in the Class Action Lawsuit Tug-of-War (Philly.com, Nov 11, 2015), archived at http://perma.cc/K6KC-2GWG. 106. For a general discussion of the value of contractual innovation, see Kevin E. Davis, Contracts as Technology, 88 NYU L Rev 83, 88–97 (2013) (discussing how innovation in contracts can beneficially change parties’ behavior). 107. See David Horton, The Shadow Terms: Contract Procedure and Unilateral Amendments, 57 UCLA L Rev 605, 654–56 (2010) (explaining how AT&T has changed its class arbitration waiver clause over time, seeking to create a version that is upheld by courts). See also AT&T Mobility LLC v Concepcion, 563 US 333, 340, 352 (2011) (holding that the California Supreme Court’s rule, which had resulted in AT&T’s arbitration waiver being found “unconscionable,” was preempted by federal law). 108. Eric Goldman, Lori Drew Conviction Reflections, Part 3 of 3: Lessons for CyberLawyers Drafting User Agreements (Technology & Marketing Law Blog, Dec 16, 2008), archived at http://perma.cc/4DDE-5T44. bumble-app-whitney-wolfe (visited Mar 31, 2018) (Perma archive unavailable). 111. 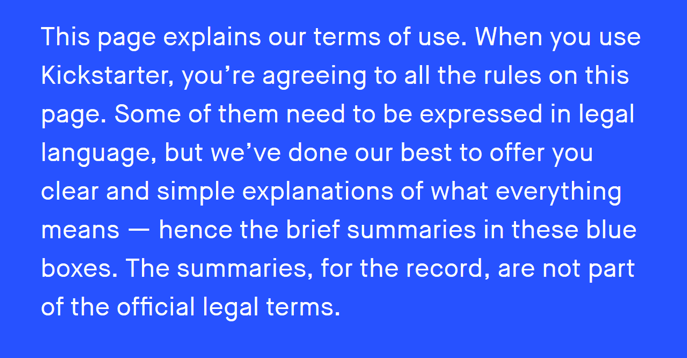 Terms and Conditions of Use (Bumble, Sept 6, 2017) (“Bumble Terms and Conditions”), archived at http://perma.cc/R9GT-N2MS. 116. To be precise, they are law school funny. 118. A semistructured interview follows a “general outline of the topics to be covered during the interview but is free to follow the flow of the interview in deciding when and how to pursue each thread.” Robert M. Lawless, Jennifer K. Robbennolt, and Thomas S. Ulen, Empirical Methods in Law 73 (Wolters Kluwer 2d ed 2016). They can be particularly helpful in interviewing attorneys. I interviewed Etsy’s policy team and Tumblr’s former general counsel by email and conducted all other conversations by phone. I sent a preliminary draft of this Article to the sources and offered them an opportunity to correct any direct quotes and suggest changes to my interpretation. (I incorporated all edits to direct quotes from interviews and some of the suggested changes to interpretation.) Each interview or email exchange focused on four basic topics: Why did the firm come to create the terms it did, what was the process of their drafting, what barriers did they face, and how did they measure or evaluate success? 119. Sharing economy firms are typically built on trust between strangers. See, for example, Calo and Rosenblat, 117 Colum L Rev at 1634 (cited in note 8). 120. Ari Shahdadi, I Fought the Law and the Law Won (Lawyerin’, Sept 25, 2015), archived at http://perma.cc/CUJ6-ZMPX. 029-ari-shahdadi/ (visited Feb 25, 2018) (Perma archive unavailable). 122. Terms of Service (Tumblr, Mar 3, 2010), archived at http://perma.cc/MK7P-XHUD. platform/ (visited Mar 31, 2018) (Perma archive unavailable). 125. Email from Ari Shahdadi, 5:45 pm (cited in note 100). 126. Email from Ari Shahdadi, 3:08 pm (cited in note 99). See also Ammori, 127 Harv L Rev at 2273 (cited in note 32) (describing Shahdadi’s willingness to send an email to every user who commented on the proposed changes to the TOS). 127. See Email from Ari Shahdadi, 3:08 pm (cited in note 99) (“[W]e went in fully knowing the risk that a court would integrate [the annotations] with the document.”). 132. Tumblr TOS, 2016 (cited in note 128). 133. Email from Ari Shahdadi, 3:08 pm (cited in note 99). 134. Email from Ari Shahdadi, 5:45 pm (cited in note 100). 138. Email from Ari Shahdadi, 5:45 pm (cited in note 100). 139. See Our Mission Is to Help Bring Creative Projects to Life (Kickstarter, 2018), archived at http://perma.cc/R7CR-RTKE. 140. Yancey Strickler, Perry Chen, and Charles Adler, Kickstarter Is Now a Benefit Corporation (Kickstarter Blog, Sept 21, 2015), archived at http://perma.cc/54NC-2TM4 (announcing Kickstarter’s incorporation as a public benefit corporation and explaining that “Benefit Corporations are for-profit companies that are obligated to consider the impact of their decisions on society, not only shareholders”). 141. Interview with Michal Rosenn (cited in note 101). 142. Charter (Kickstarter, 2018), archived at http://perma.cc/PJQ3-PH3B. Rosenn, noting that the charter postdated the revision, suggested that the former’s language reflected the firm’s motivation and attitude during the reform process. Interview with Michal Rosenn (cited in note 101). 144. Interview with Hissan Bajwa (cited in note 103). 147. Interview with Michal Rosenn (cited in note 101). 152. Interview with Michal Rosenn (cited in note 101). 154. Interview with Hissan Bajwa (cited in note 103). Bajwa was previously senior counsel at Etsy and the founder and CEO of SpotlessCity. 156. Interview with Hissan Bajwa (cited in note 103). 158. Email from Bonnie Broeren, Head of Policy, Etsy, to David A. Hoffman (Mar 27, 2017, 11:09 am EDT) (“Email from Bonnie Broeren, 11:09 am”) (on file with author); Interview with Hissan Bajwa (cited in note 103) (“We came up with this style guide or lexicon so that [the house rules] will be treated as a unit, . . . in the same voice.”). 159. Email from Bonnie Broeren, 11:09 am (cited in note 158). 161. Interview with Hissan Bajwa (cited in note 103). 168. Handmade Policy (Etsy, Feb 22, 2017), archived at http://perma.cc/4642-HHL4. Etsy hoped that “fun illustrations” would “clarify what we were saying in the accompanying text.” Email from Bonnie Broeren, 11:09 am (cited in note 158). 169. Email from Bonnie Broeren, 11:09 am (cited in note 158). 172. Email from Bonnie Broeren, Head of Policy, Etsy, to David A. Hoffman (May 26, 2017, 2:22 pm EDT) (“Email from Bonnie Broeren, 2:22 pm”) (on file with author). 173. Interview with Hissan Bajwa (cited in note 103). 174. See Benjamin Edelman, Michael Luca, and Dan Svirsky, Racial Discrimination in the Sharing Economy: Evidence from a Field Experiment, 9 Am Econ J: Applied Econ 1, 2–3 (2017). 175. Telephone Interview with Rob Chesnut, General Counsel, Airbnb (Apr 14, 2017) (“Interview with Rob Chesnut”) (on file with author). 179. Interview with Rob Chesnut (cited in note 175). 182. Id. For discussion of Holder’s role at Airbnb, see David McCabe, Airbnb Enlists Civil Rights Leaders in Discrimination Fight (The Hill, Sept 11, 2016), archived at http://perma.cc/4NKK-XLRS; Brian Chesky, An Update on the Airbnb Anti-Discrimination Review (Airbnb, July 20, 2016), archived at http://perma.cc/J6W3-ADW3. 183. Interview with Rob Chesnut (cited in note 175). 185. 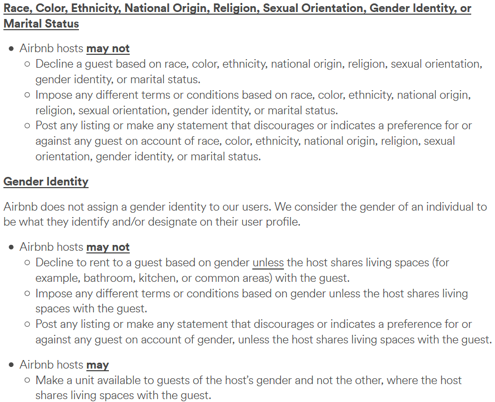 Airbnb’s Nondiscrimination Policy: Our Commitment to Inclusion and Respect (Airbnb), archived at http://perma.cc/TU6W-ZNLH. technology/airbnb-anti-discrimination-rules.html (visited Apr 1, 2018) (Perma archive unavailable). 188. See Ruomeng Cui, Jun Li, and Dennis J. Zhang, Discrimination with Incomplete Information in the Sharing Economy: Evidence from Field Experiments on Airbnb *25–26 (Dec 8, 2016), archived at http://perma.cc/9QJH-ZMFN (finding evidence that discrimination persists even after the change in terms). 189. Interview with Rob Chesnut (cited in note 175). 192. Id. After I talked with Chesnut, the firm announced that it had reached a settlement with a California regulator to allow the state to conduct such tests on its behalf. See Sam Levin, Airbnb Gives in to Regulator’s Demand to Test for Racial Discrimination by Hosts (The Guardian, Apr 27, 2017), archived at http://perma.cc/Q63W-XZEZ. 193. See Interview with Rob Chesnut (cited in note 175). -whitney-wolfe.html (visited Apr 1, 2018) (Perma archive unavailable). 195. Telephone Interview with Miranda Lerner (Jun 9, 2017) (“Interview with Miranda Lerner”) (on file with author). Lerner was Head of Legal at Bumble from 2014 through 2016. The app launched during her tenure. Id. 198. Bumble Terms and Conditions (cited in note 111). 199. There is evidence that firms may motivate information acquisition by teasing mysteries. See, for example, Dina Mayzlin and Jiwoong Shin, Uninformative Advertising as an Invitation to Search, 30 Marketing Science 666, 680 (2011) (reporting experimental findings that vague advertising “may increase consumers’ likelihood to search for information about the product”). But Bumble did the opposite: it suggested that there was nothing worth learning in the terms. 200. See Interview with Miranda Lerner (cited in note 195). 201. I found only a few examples from contemporaneous sources lauding the terms. See, for example, Bumble Buzzes over to Android (Droid Report, Dec 14, 2015), archived at http://perma.cc/NJ5X-2UZ8 (“[Bumble’s] Terms and Conditions also indicate that the app will police for abusive, threatening and even defamatory or libelous language and content, as well as content that is ‘obscene, pornographic or otherwise may offend human dignity.’”). 202. Interview with Miranda Lerner (cited in note 195). 205. Interview with Hissan Bajwa (cited in note 103). 206. For a general discussion of relational contracting, see generally Ian R. MacNeil, Relational Contract Theory: Challenges and Queries, 94 Nw U L Rev 877 (2000). See also Charles J. Goetz and Robert E. Scott, Principles of Relational Contracts, 67 Va L Rev 1089, 1091 (1981) (“A contract is relational to the extent that the parties are incapable of reducing important terms of the arrangement to well-defined obligations.”). 207. Others, notably Professor Ethan Leib, have suggested that courts should evaluate consumer contracts using relational doctrines. See Ethan J. Lieb, What Is the Relational Theory of Consumer Form Contract?, in Jean Braucher, John Kidwell, and William C. Whitford, eds, Revisiting the Contracts Scholarship of Stewart Macaulay: On the Empirical and the Lyrical 259, 277–80 (Hart 2013). Leib claims that such contracts function as bureaucratic plans that stand not on particular assent to terms but rather “consensual entry into already legitimate relations.” Id at 269. He would police terms using the reasonable expectations doctrine. Id at 276. There is much in this work that I agree with, but of course my focus is different: adhesive contracts that are intended to be read and to influence ex ante behavior. 208. Email from Ari Shahdadi, 5:45 pm (cited in note 100). 209. Interview with Michal Rosenn (cited in note 101). 210. Email from Bonnie Broeren, 2:22 pm (cited in note 172). 211. Interview with Rob Chesnut (cited in note 175). 214. Professor Curtis Anderson, formerly the general counsel of the Match Group (of Match.com and Tinder), told me that Match decided not to follow the Tumblr and Etsy model for terms because of a judgment that a two-track model for terms (and additional illustrations) added legal risk that courts would render important legal protections for the firm unenforceable. Telephone Interview with Curtis Anderson, Associate Teaching Professor, Brigham Young University Law School (Apr 20, 2017) (“Interview with Curtis Anderson”) (on file with author). 215. In addition to the Tinder relationship discussed above, I found reference in contemporaneous press to concerns about Bumble’s relationship to Badoo, a well-known European social networking and dating site that had been criticized for its privacy practices. See Steve O’Hear, Tinder Rival Bumble Is Majority-Owned by European Dating Behemoth Badoo (TechCrunch, Mar 25, 2016), archived at http://perma.cc/2H3E-945V. To the extent that Bumble wished to signal its distance from that criticism, informal terms would seem to have been a useful approach. 216. See Interview with Miranda Lerner (cited in note 195). 217. Others have suggested that contracts can serve a branding function, though not in the consumer context. See, for example, Victor Fleischer, The MasterCard IPO: Protecting the Priceless Brand, 12 Harv Negotiation L Rev 137, 153 (2007) (focusing on MasterCard’s transactional structuring as a form of brand enhancement); D. Gordon Smith, The “Branding Effect” of Contracts, 12 Harv Negotiation L Rev 189, 195–98 (2007) (discussing the information-conveying function of contracts in the venture capital context). 218. I mean this in the colloquial sense—I’m not sure that the TOS would meet the Lanham Act definition of trade dress, in part because they are functional. See Fair Wind Sailing, Inc v Dempster, 764 F3d 303, 309 (3d Cir 2014) (identifying elements of trade dress infringement, including that the infringing design be “nonfunctional”). -funny-2014-1 (visited Apr 1, 2018) (Perma archive unavailable). I am not arguing that the motivation for change by Shahdadi was primarily instrumental. I think he held a sincere belief that it was, in fact, the right thing to do. Rather, he was able to justify his motivation in terms that spoke across constituencies. 220. See Interview with Hissan Bajwa (cited in note 103). 221. Email from Bonnie Broeren, 11:09 am (cited in note 158). 222. Interview with Rob Chesnut (cited in note 175). 223. Julie Beck, Zynga Inc.: Game-ification, InsideCounsel 58 (Sept 2012). 225. Telephone Interview with Jay Monahan (Jan 3, 2018) (“Interview with Jay Monahan”) (on file with author). 226. See Federal Trade Commission, Protecting Consumer Privacy in an Era of Rapid Change: A Proposed Framework for Businesses and Policymakers (Dec 2010), archived at http://perma.cc/2X5N-EPXB. 227. Interview with Jay Monahan (cited in note 225). 229. See Danielle Keats Citron, Law’s Expressive Value in Combatting Cyber Gender Harassment, 108 Mich L Rev 373, 412–13 (2009). 230. See Citron, Hate Crimes in Cyberspace at 230–31 (cited in note 41). 232. Gomulkiewicz, 12 Geo Mason L Rev at 696 (cited in note 86). 233. This relates to a point made by Citron about how vague TOS can dilute expressive messages. Citron, Hate Crimes in Cyberspace at 231 (cited in note 41) (explaining that “[t]he more clearly and specifically companies explain those terms and the harms that they want to prevent, the better users will understand what is expected of them”). 234. See Ryan Calo, Digital Market Manipulation, 82 Geo Wash L Rev 995, 1018 (2014) (“A firm with the resources and inclination will be in a position to surface and exploit how consumers tend to deviate from rational decisionmaking on a previously unimaginable scale.”); Calo and Rosenblat, 117 Colum L Rev at 1623 (cited in note 8) (arguing that contracting is a way that firms like Uber exploit their drivers). 235. See Brett Frischmann and Evan Selinger, Re-Engineering Humanity ch 4 (Cambridge 2018) (arguing that consumer contracts are shaping preferences in nefarious ways). 236. See Interview with Hissan Bajwa (cited in note 103) (“Unlike most or many consumer sites, we have an active community and our sellers are an active community who read every word of this.”). See also Gomulkiewicz, 12 Geo Mason L Rev at 700–01 (cited in note 86) (arguing that, in the software industry, lawyers’ exclusive role in drafting terms hampers user-friendliness). 237. Email from Ari Shahdadi, 3:08 pm (cited in note 99). 238. Peter P. Swire, The Surprising Virtues of the New Financial Privacy Law, 86 Minn L Rev 1263, 1316 (2002) (contending that disclosure requirements trigger self-examination by firms). 239. See Citron, Hate Crimes in Cyberspace at 232 (cited in note 41) (describing the Inter-Parliamentary Task Force on Internet Hate’s Anti-Cyberhate Working Group’s discussions about “developing guidelines that will help users better understand terms-of-service requirements”). 240. Interview with Hissan Bajwa (cited in note 103). 242. Id. 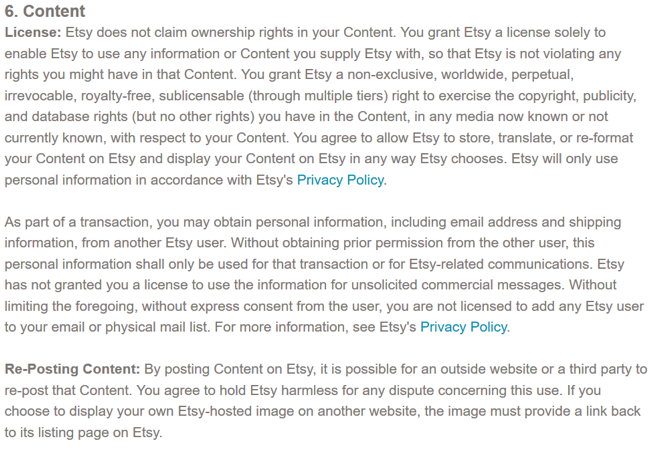 In some ways, Etsy’s process followed the model process laid out by Gomulkiewicz for how one might design a user-friendly contract, though there is no evidence that they knew of his work. See Gomulkiewicz, 12 Geo Mason L Rev at 703–05 (cited in note 86) (detailing the model process, which includes using an interdisciplinary team and creating terms that are cohesive, user-friendly, and well designed). 243. 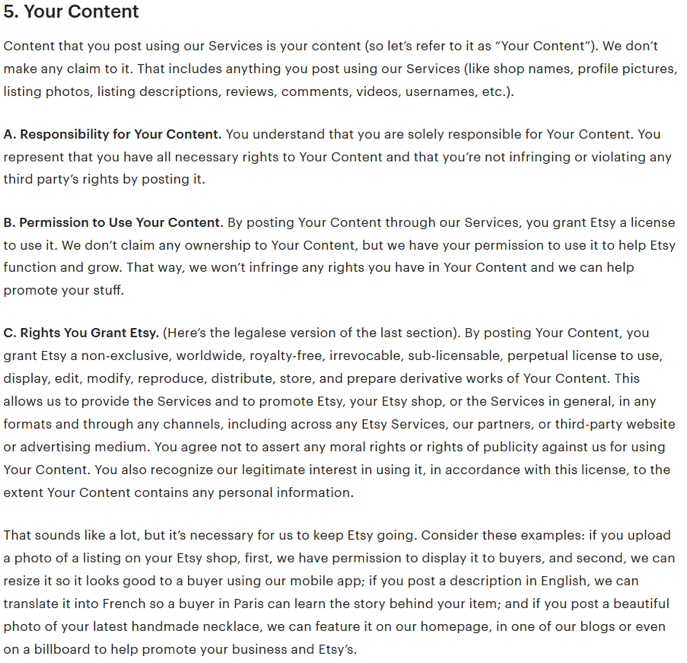 See Sarah Perez, SnapTerms: Terms of Service as a Service (TechCrunch, Apr 13, 2012), archived at http://perma.cc/3XXC-KVPT. 244. Telephone Interview with Hansen Tong (Apr 27, 2017) (“Interview with Hansen Tong”) (on file with author). Tong was a co-owner of Snapterms and one of the individuals involved with its business operations until it closed for a “pivot” in late 2014. 245. Snapterms.com Terms of Service (Snapterms, 2017), archived at http://perma.cc/AHA9-REQN. 246. Obviously, the Snapterms team did monitor client feedback (which was positive) and followed reviews online at places like Reddit to be sure that the market regarded its terms as clear. My point is that it did not design processes to learn about the terms in a more rigorous way. See Interview with Hansen Tong (cited in note 244) (noting that they spent time improving the readability of the indemnification, representations and warranties, and limitations on liability terms). 247. Id (explaining that Snapterms bought legal terms from LegalZoom, hired copywriters to insert humor, and looked to Tumblr in drafting explanatory phrases). 248. Indeed, Etsy, Tumblr, and Kickstarter arose from the same venture capital fund, Union Square Ventures, and share an outside counsel, Gunderson Dettmer. Interview with Hissan Bajwa (cited in note 103). 249. One driver of innovation might be that the firms I studied had relatively simple business models and relatively low risk exposures. Match.com, by contrast, was exposed to a high likelihood of user-generated lawsuits, including for tortious conduct by other users that might be attributed to the firm. Interview with Curtis Anderson (cited in note 214). The audience for Match’s terms and conditions was courts and regulators, not primarily consumers. Id. rRi8LptvFZY (visited Apr 1, 2018) (Perma archive unavailable). 251. This is in accord with Professor Victor Fleischer’s insight about “branding moments” in a corporation’s life, when otherwise sterile forms (like a charter) can further its brand. Fleischer, 12 Harv Negotiation L Rev at 151–53 (cited in note 217); Victor Fleischer, Brand New Deal: The Branding Effect of Corporate Deal Structures, 104 Mich L Rev 1581, 1600, 1628 (2006) (explaining that branding moments are most important early in a company’s life). 252. Email from Bonnie Broeren, 11:09 am (cited in note 158). 253. See Gavia Baker-Whitelaw, Tumblr Users Panic as Accounts Are Deleted for Copyright Violations (The Daily Dot, Feb 24, 2015), archived at http://perma.cc/CUP5-S25Q. 254. See Claire A. Hill, Why Contracts Are Written in “Legalese”, 77 Chi Kent L Rev 59, 78–80 (2001) (highlighting the challenges of changing terms in contracts); Clayton P. Gillette, Lock-In Effects in Law and Norms, 78 BU L Rev 813, 819 (1998) (contrasting the lack of contract innovation with innovation in technology); Henry T. Greely, Contracts as Commodities: The Influence of Secondary Purchasers on the Form of Contracts, 42 Vand L Rev 133, 168 (1989) (comparing the difficulty of innovation in standardized contract terms to trying to change the dominant QWERTY keyboard layout). 255. Davis, 88 NYU L Rev at 108 (cited in note 106) (explaining that innovation results from “learning-by-doing”). 256. Email from Bonnie Broeren, 2:17 pm (cited in note 102). 257. Interview with Hissan Bajwa (cited in note 103). 258. Id. See also Gomulkiewicz, 12 Geo Mason L Rev at 701 (cited in note 86) (describing “[l]ack of leadership by [ ] senior management” as a barrier to innovative contract drafting). 259. Interview with Michal Rosenn (cited in note 101). 260. Interview with Ed Ferguson and Michael Cheah (cited in note 83). 262. See text accompanying notes 51–53. 263. For an influential analysis of this type of contract, see Friedrich Kessler, Contracts of Adhesion—Some Thoughts about Freedom of Contract, 43 Colum L Rev 629, 631–32 (1943) (describing the rise of consumer contracts of adhesion). 264. See text accompanying notes 69–70. 265. See About Etsy (Etsy, Sept 31, 2017), archived at http://perma.cc/LE7X-KW9U (describing 1.9 million “active sellers” on the platform). 266. See notes 283–86 and accompanying text. 267. For an example of a similar practice, see Gillian K. Hadfield, Legal Infrastructure and the New Economy, 8 I/S: J L & Pol Info Socy 1, 46–47 (2012) (reporting that the CBS general counsel wanted lawyers who could design a “relational structure”). 268. An analogy is to online dispute resolution systems, like that of Wikipedia, which seek to weed out problematic users but otherwise motivate productive editors to continue to dispute (and generate content for the platform). See David A. Hoffman and Salil K. Mehra, Wikitruth through Wikiorder, 59 Emory L J 151, 170–74 (2009) (exploring Wikipedia’s dispute resolution system). 269. For an analysis of this distinction, see Ian R. Macneil, The New Social Contract: An Inquiry into Modern Contractual Relations 10 (Yale 1980) (distinguishing discrete contracts from relational ones). For an early, aspirational version of relational contracting in digital spaces, see Andrea M. Matwyshyn, Mutually Assured Protection: Toward Development of Relational Internet Data Security and Privacy Contracting Norms, in Anupam Chander, Lauren Gelman, and Margaret Jane Radin, eds, Securing Privacy in the Internet Age 73, 81–82 (Stanford 2008). But see Bar-Gill and Davis, 84 S Cal L Rev at 35 (cited in note 7) (noting that consumer contracts are sometimes designed to govern long-term relationships). 270. Lisa Bernstein, Beyond Relational Contracts: Social Capital and Network Governance in Procurement Contracts, 7 J Legal Analysis 561, 562 (2015). 271. Bumble Terms and Conditions (cited in note 111). 272. See Oliver Hart, Economica Coase Lecture: Reference Points and the Theory of the Firm, 75 Economica 404, 407 (2008). 273. For analyses of typical relational contracting counterparties, see Amy J. Schmitz, Access to Consumer Remedies in the Squeaky Wheel System, 39 Pepperdine L Rev 279, 290–300 (2012) (describing the characteristics of consumers); Bernstein, 99 Mich L Rev at 1762–64 (cited in note 53) (describing relational contract relationships in the cotton industry); Lisa Bernstein, Opting Out of the Legal System: Extralegal Contractual Relations in the Diamond Industry, 21 J Legal Stud 115, 130–32 (1992) (same, in the diamond industry); Macaulay, 28 Am Sociological Rev at 65–67 (cited in note 53). 274. See Bernstein, 21 J Legal Stud at 140 (cited in note 273) (explaining that reputational bonds are generally effective only in homogeneous groups). 275. For more on the role of enforceability (however defined), see Andrew A. Schwartz, Consumer Contract Exchanges and the Problem of Adhesion, 28 Yale J Reg 313, 324–26 (2011) (arguing that legal enforceability is necessary for a contract to have value and that relational contracts are a viable alternative to legal enforceability only if the parties have a personal, long-term relationship). 276. See Ronald J. Mann and Travis Siebeneicher, Just One Click: The Reality of Internet Retail Contracting, 108 Colum L Rev 984, 1011 (2008) (“Although many of the customers are repeat customers, there is by definition almost no opportunity online for the kind of personal interaction that characterizes relational contracting as it is commonly understood.”); F. Scott Kieff, Coordination, Property, and Intellectual Property: An Unconventional Approach to Anticompetitive Effects and Downstream Access, 56 Emory L J 327, 356 (2006) (noting that relational contracting is effective “within homogeneous communities”). 277. Aditi Bagchi, Parallel Contract, 75 U Pitt L Rev 139, 142 (2013). 278. Selection plays a role here—only exculpatory terms are typically tested in court, leading to decisions that are the grist for law review treatments. perma.cc/K9KL-UGEH (finding that readers ignored terms when joining a networking site, in part because of “information overload”). 280. See Ayres and Schwartz, 66 Stan L Rev at 553 (cited in note 1). 281. For a skeptical discussion, see Omri Ben-Shahar and Carl E. Schneider, More than You Wanted to Know: The Failure of Mandated Disclosure 135–37 (Princeton 2014) (discussing the failure of nutrition labels and people’s inability to understand them). 282. See id at 125 (“Simplicity . . . is usually in tension with full disclosure.”). 283. Similarly difficult to determine is how courts ought to fold the design features of such contracts into their explicit terms. See Hartzog, 60 Am U L Rev at 1653–61 (cited in note 24) (arguing for courts to consider online contract terms’ design when evaluating them). 284. Calo and Rosenblat, 117 Colum L Rev at 1627–28 (cited in note 8) (“The sharing economy seems poised to do a great deal of taking—extracting more and more value from participants while continuing to enjoy the veneer of a disruptive, socially minded enterprise.”). 285. See generally, for example, Mark Fenster, Coolhunting the Law, 12 Harv Negotiation L Rev 157 (2007) (analyzing lawyers’ roles in crafting companies’ brands). 286. Even if data on readership rates were not illuminating, certainly such firms could (and maybe do) have information about customer service load. See, for example, Mathew Patterson, How Top Customer Service Teams Measure Performance (HelpScout), archived at http://perma.cc/AU98-VQHL (describing a tool that provides real-time metrics on customer service activity). 287. See Calo and Rosenblat, 117 Colum L Rev at 1650–54 (cited in note 8) (explaining how firms can “nudge” consumers to behave in ways beneficial to the firm). 288. Digital rights management (DRM) allows parties to control access to information and to track and monitor content. Rebecca Wexler, The Private Life of DRM: Lessons on Privacy from the Copyright Enforcement Debates, 17 Yale J L & Tech 368, 373 (2015). In Europe, the Pirate Party system was built on opposition to DRM technologies. See id at 379–81 (describing the Pirate Party’s foundational orientation against DRM restrictions); Rub, 103 Va L Rev at 1215–16 (cited in note 13) (exploring DRM as an alternative to contractual control). 289. See Alexander Savalyev, Contract Law 2.0: Smart Contracts as the Beginning of the End of Classic Contracts Law, 26 Info & Communications Tech L 116, 123 (2017) (“But in contrast to classic contract where trust is put in the personality of the other party to the contract, in Smart contracts such trust is put in the computer algorithm standing behind the agreement.”); Joshua Fairfield, Smart Contracts, Bitcoin Bots, and Consumer Protection, 71 Wash & Lee L Rev Online 35, 38 (2014) (defining smart contracts as “automated programs that transfer digital assets”). -new-tools-for-lending.html (visited Apr 1, 2018) (Perma archive unavailable) (describing Earnest, a lending firm that generates risk profiles for borrowers based in part on how long they spend reading the online terms and conditions of the loan).